Slick Slick Slick 5 I got this after chatting with Nick and was very impressed. After I put it on my wife's white Rogue she drove in a heavy rain and even she commented on how clean the car stayed. Extender Spray Wax 5 Just spray and wipe off immediately, doing one panel at a time. In approximately 15 minutes you have a completely waxed vehicle with a new like finish. Pros:Usable in direct sunlight on hot surfaces. McKee's 37 Trademark Extender Spray Wax 5 I was a little skeptical of the advertising hype but being satisfied with my other McKee's purchases decided to give it a try. Turns out, it's not hype at all. Leaves a nice glossy finish and I'm finding less dust sticking to the paint. Great topper in between applications of McKee's 37 Paint Coating. Started with the 16oz spray and just ordered the gallon. Pros:Ease of use, doesn't streak or smear like some other spray waxes. My New Favorite Spray Wax 5 I live in South Florida, and have no shade in which to wash or wax my car. I often use quick detailers when drying my car to eliminate water spots. What I love about this product is it works, on extremely hot surfaces, in direct sunlight, with NO PROBLEMS at all! 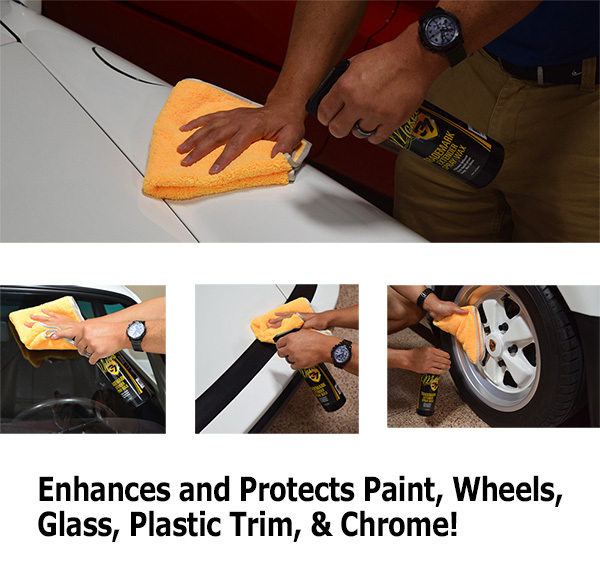 No streaks, leaves a nice gloss, real protection, and makes the paint nice and slick! Pros:Works in direct sunlight on hot surfaces!